← Dromochorus pruinina is not extirpated in Missouri… yet! Here is the latest Super Crop Challenge – can you identify the structures and the organism (order, family, and genus) to which they belong? Bonus points will be awarded for relevant supporting information, at my discretion. Standard challenge rules apply, including moderated comments (to give everyone a chance to participate) and early submitter points for beating others to the same correct answer. No need to look to exotic locations for the answer, it’s right here in the good ol’ USA. I’ll follow up in a day or so. Um. I think it’s probably a Lepidoptera caterpillar, and that those are fleshy projections on the back (the only term I’m coming up with is “setae”, but I always thought those were more hair-like.) The shape of the projections makes me think that they are dispersers for some sort of defensive chemical, the bifurcation would give them a lot more surface area than a single projection. Hi Tim – not Lepidoptera, but I’ll give you 2 pts for caterpillar, 2 pts for “projections on the back”, and a bonus point each for being first with those answers. I want say it’s a larva of Saturniidae: Automeris io, but the spikes aren’t sufficiently branched — unless that’s how they look in the first instar? 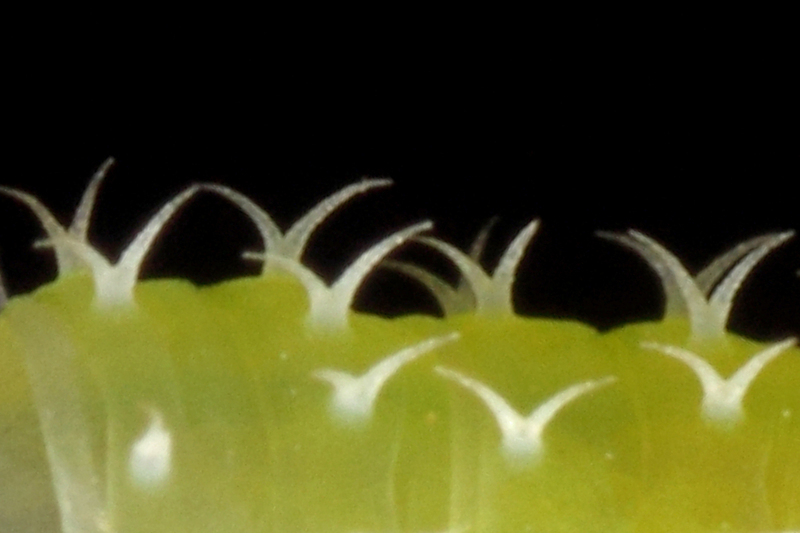 Not Lepidoptera – 2 pts for larva and 2 pts for mentioning branched spikes = 4 pts. Ted, I would like to participate in your Challenges, but I see that I have a lot of learning to do before I can come up with the desired terms of the answer: naming the order, family and genus of the creature in the photo. That is fine, I love learning. Can you point me to internet resources or books that might help me determine the answer, even though I am not an entomologist? Or is the challenge especially for those preparing for or already practicing entomology careers? In any case, your photo does have me thinking how to identify the critter. As an information technology specialist, detective hunts do have a certain appeal to me. These are supposed to be fun, no-pressure brain teasers – entomological know-how helps, but (as you later demonstrate) even newbies can get in on the fun and earn some points. There are tons of resources on the web and in bookstores for getting into entomology, but BugGuide should be your first stop! Ted, thank you for pointing me to BugGuide. I am following your site daily now and I hope to learn more about insects over time. Welcome aboard – your readership is greatly appreciated! Order Lepidoptera, Family Limacodidae, genus Acharia: the saddleback caterpillar, Sibine stimulea. This is a guess made by my wife who is the gardener here. I googled to figure out the order, family and genus…but it propably is not the creature in the photo. It is a pity that I can’t use the image itself as a Google search term. Not Lepidoptera (but you’re in good company for guessing this order). I’ll give you 2 pts for caterpillar. Hi Ted, thank you for the 2 points! Also for the followup article on the sawfly larva. My wife just told me the story of how she found sawfly larva near the stump of an oak tree we had removed several years ago. They were actually infesting a nearby plant. I say order Lepidoptera, family Noctuidae, genus Pseudoplusia, species includens–the Soybean Looper! Hi Anne – no Lepidoptera (though an understandable guess). Nobody walks away empty handed, so you get a bonus point for playing. Okay, this picture has sat here long enough. Rather than do some real work or stumble outside to inhale the smoke-filled air, I’ll make a show of my inexpertise. Maybe that will make it go away. Based on the serially repeated structures and segmental borders this should be either an Annelida or Arthropoda. It doesn’t look mushy enough to me to be a worm (this is the best scientific reasoning I can come up with), so I will guess Arthropoda probably a larval member of the pterygote Insecta. The serially repeated processes have no insertions, so they are not setae or other normal chemo-mechanoreceptors. I think they are bifurcate cuticular processes (this sounds scientific to me) and I have seen similar processes on maggots (Diptera) and caterpillars (Lepidoptera). Most maggots are too small for such sharp focus (although I may be underestimating BiTB’s skill) and the greenish colour also suggests Lepidoptera to me. Ted works in soybeans, but soybean caterpillar was no help in Google. I just asked my wife for help and she said ‘looks like a fly larva or caterpillar to me’. OK, larval Lepidoptera, dorsal surface, bifurcate cuticular projections. I was about to give up on anybody getting this challenge when I saw the Great Macromite Dave also falling into the Lepidoptera trap. By happenstance, I could not update this blog until now, and I see you used the last hour chance to pull out the win! Even when you’re wrong, your line of reasoning and clarity with which you explain it is itself worth a bonus point! Sawfly larvae of the genus Periclista, Konow, e.g. P. marginicollis (Norton, 1861) have bifurcate processes like the ones shown in your picture and occur in your neck of the woods. Yes on all counts—2 pts each for order, family, and genus, as well as for the terms “larva” and “bifurcate processes.” With your bonus point from the first comment, you win the challenge handily with 11 pts.